Alfred Hitchcock liked to punch holes in the everyday, to find devouring swamps where maps showed solid ground. He channeled how desperately the child in every grown-up craves and fights for the familiar and explicable, putting his/her faith in people and places seemingly secure from ruptures in normalcy. When such a rupture occurs, as in The Birds, Tippi Hedren’s lacquered blonde, gang-raped by nightmare beaks, regresses to gibbering girl-child. M. Night Shyamalan’s The Visit focuses on a couple of actual children for whom life goes all Caligari-cattywampus. Working Hitchcockian elements of existential terror into a grotesque Hansel and Gretel fairy tale, Shyamalan has delivered a satisfyingly scary old-school hair-raiser that’s smart, funny, and deeply disturbing. 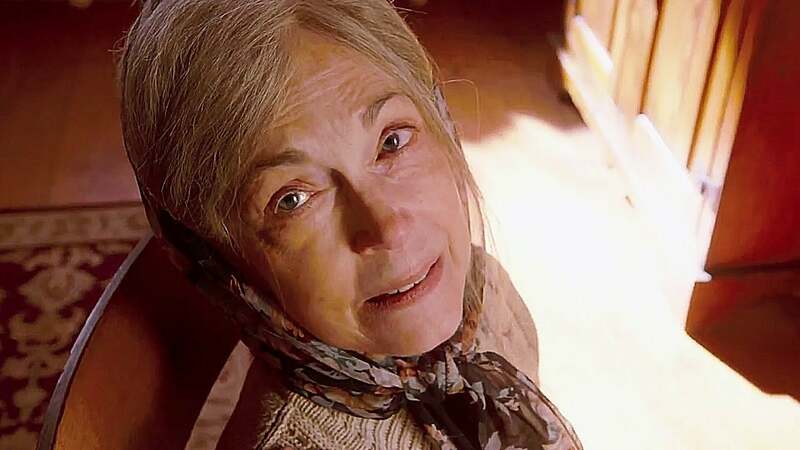 Even as The Visit ruthlessly erodes faith in the reliability of family, it eats away at our trust in movie-frame space to contain some kind of rational design, its boundaries proof against sudden fracture. This is Becca and Tyler’s movie in more ways than one: From the start, brainy big sister directs a sort-of documentary of family, interviewing her mom on why and how she cut off all contact with her own mother and father, recording her younger bro’s hilarious “white bread” rap rants, and facing the camera to offer cinematically informed directorial commentary. The siblings are just going off to visit their grandparents, strangers eager to finally get to know their long-estranged daughter’s children. The trip’s a bona fide adventure, but the kids’ real priority is sending their mother off on a vacation cruise with her boyfriend. The handsome guy mom ran away from home to marry, whom we see—twice–in a cherished home movie cuddling much smaller, blissfully happy versions of Becca and Tyler, has exited the picture, his affections alienated by a new lady. Sister and brother may hope mom will come back from her cruise closer to casting a new dad in their home movie, restoring balance to the family tree. From the start, Becca (Olivia DeJonge) and Tyler (Eric Oxenbould) impress and charm us with their “performances” as budding filmmaker and wannabe rapper. Attractive and precocious, given to smart, comic banter, the two seem unusually tight given their respective ages and genders. Look closer; there’s a desperate edge to their “grown-up” style and self-possession. We begin to see that these allies have taken up arms against the trauma of abandonment, the dissolution of what seemed forever. You could say that these kids have chosen aesthetic frames of reference to contain devastating loss, to keep away the “deep darkies” (their grandma’s pungent phrase). Their co-directed documentary is a kind of night-light for two kids who are afraid of the dark. Later, both Becca and Tyler—in separate, heartbreaking interviews for the documentary—let fall their masks of wise-cracking self-possession, exposing the real emotional cost of a father’s desertion. And so our Hansel and Gretel travel into the wintry Pennsylvania woods (Shyamalan’s home ground) for a cozy week with their grandparents, a sojourn that should be safe as houses. But when the kids arrive in the train station, Shyamalan shoots the welcoming elders standing up on a bridge, at odd distance, so that we can’t really see the actual moment of contact. But the angle’s only mildly unsettling, and the two seem typecast for the roles of somewhat dotty old people—affectionately dubbed “Pop-Pop” (Peter McRobbie) and “Nana” (Deanna Dunagan)—who do normal things like cook tasty breakfasts and take long walks and go to bed at 9:30pm and, of course, warn against going into the cellar because of the mold. The old folks even sit down for interviews with doc-director Becca, although Nana goes a little bonkers when pressed for information about what happened the last day she saw her own daughter. Things are not what they seem for very long; zones of terror open in The Shed, The Barn, Under the House, and most especially in the nighttime, after 9:30’s witching hour. Becca and Tyler try to keep the heebie-jeebies at bay by turning the camera on the worst of it, in the vain hope that its rectangular frame will work as a shield, mediating the unimaginable. But madness keeps exploding into the camera frame, through windows and doorways—as though mocking the notion that any frame of reference is durable against irrational invasion. It’s both funny and poignant how long and hard these beleaguered children work to buy into their grandparents’ explanations for the horror-movie tropes they’re witnessing. It says much about their desperate desire for existential order and security. Does Pop-Pop hide feces-smeared diapers? Do the weird sounds outside the kids’ bedroom turn out to be Nana scrabbling around the hallways on all fours? Labels for old-people maladies are served up by the grandparents, then researched on Google: Nana is “sundowning,” a term associated with early Alzheimer’s, and Pop-Pop is embarrassingly “incontinent.” The labels don’t hold, of course, and Becca and Tyler are plunged into a horrorshow that’s partly a projection of lunatic yearning by Pop-Pop and Nana for family ties. Shyamalan perfectly paces his cinematic externalization of a child’s worst nightmares, neither retarding nor rushing the horror, leavening it with occasional crazy hilarity. (Tyler’s fall-down funny, miming his grandmother’s mad, Mick Jagger strut in the dead of night.) Footage on Becca’s computer wavers between “well, this might be sort-of normal” and “oh, god, run away screaming,” continually teasing Becca and Tyler—and us—with the awful possibility that a minute adjustment of focus could reveal Lovecraftian or Hitchcockian monsters. Indeed, the most chilling and revelatory line in The Visit, delivered by mom after Becca Skypes her grandparents returning from a walk, nails the awful shiftiness of everything we rely on to be real. Shyamalan’s kids are tested in the heart of their very own brand of darkness. The results of that trial are ambiguous: The Visit’s final shot frames a domestic scene that may be located on home ground—or in just another corner of the loony bin. Last word: I’ve elected to omit the obligatory blather about M. Night Shyamalan having proved himself a failure as a director. We all know the party-line, and you will probably read it in every review of The Visit, which will be labeled either a comeback or further proof of creative bankruptcy. If you’ve bought into all that, so be it, but I would suggest you take a second and closer look at The Happening.